I love this time of the year. It is cool overnight and then heats right up during the day. The leaves of the trees are just starting to turn and there are birds flocking in their branches. Something is happening with the light: it is bright, but coming in at a lower angle that is the first hint of the southern winter sun to come. Mostly my garden is done blooming and this is when I decide which plants I want to save and bring inside for the winter. One thing is for sure. The indoor plants this year will be pink bloomers. I did plant some other colors. I was rocking the orange and yellow in June, but those guys have quit for the year. There was a lot of lavender and purple for awhile, but now there is mostly pink. I have four pots of flowers blooming on my deck by the lounger. 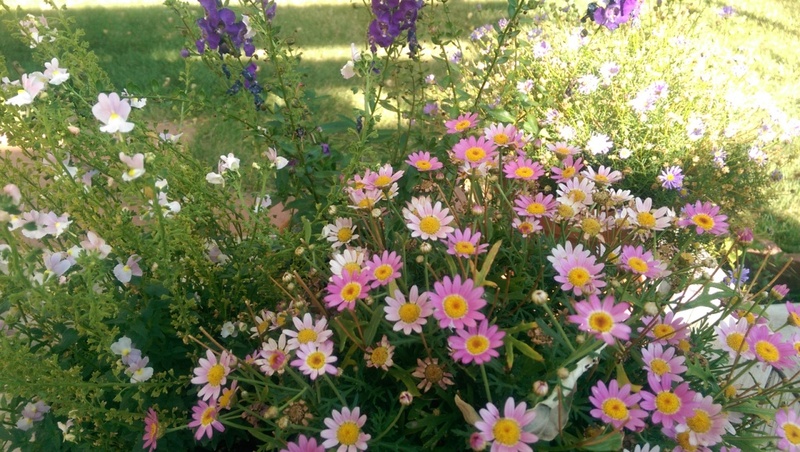 The one that is doing the best is that pink daisy. Hmm… I’ve never kept a plant like this inside over the winter. I wonder how it will do? This lantana is actually three years old. It hangs out with the orchids by a window under a grow light all winter. The leaves drop when it goes back outside in the spring, but it always recovers. It sure is blooming now, so it’s coming back inside for another winter. Look how cheerful it is! Perfect for the gloomy days to come. 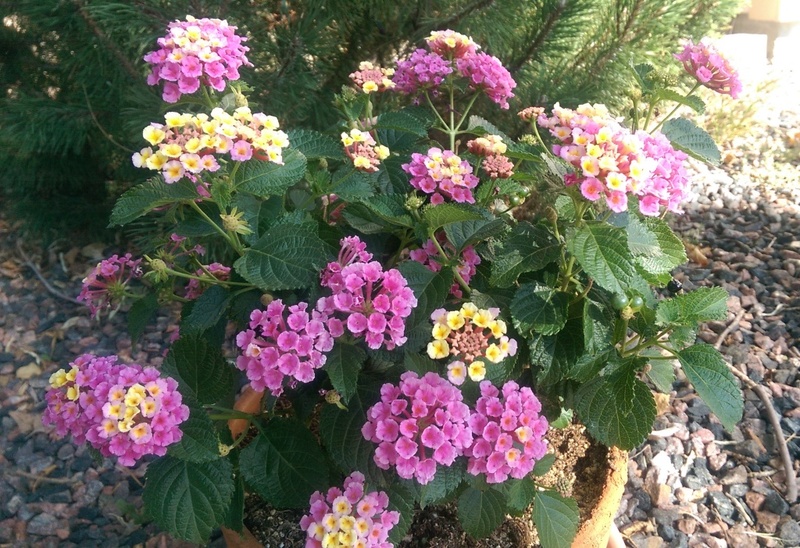 I also have four of these pink lantana plants in pots in my front yard. I’m torn about trying to save all of them. 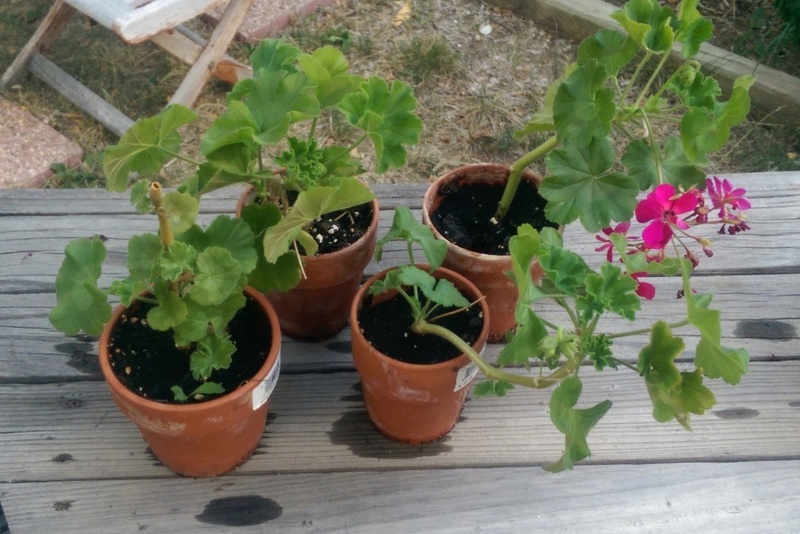 It doesn’t make sense to spend a ton of money for grow lights, but they sure are nice plants… I really miss the greenhouse that I used to have connected to my classroom in situations like this. 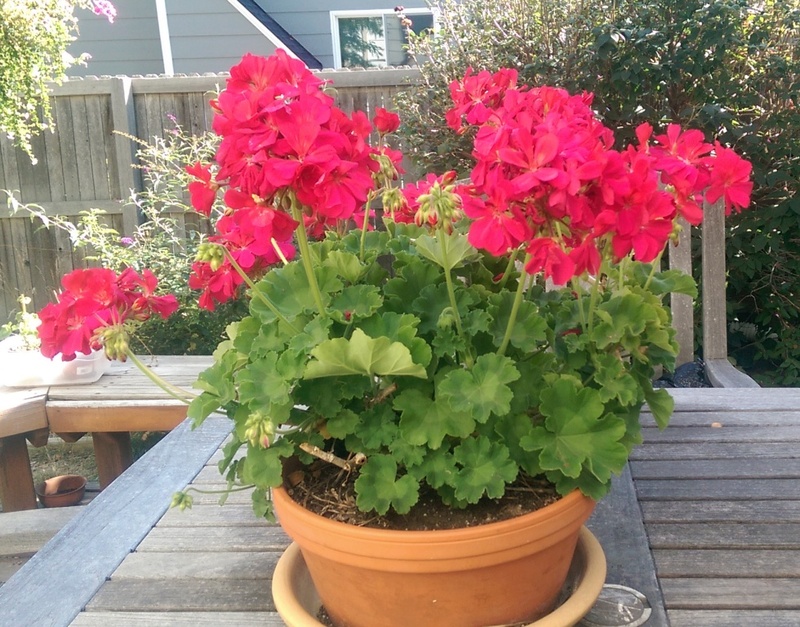 This geranium is coming to live in my bedroom over the winter for sure. The plant is actually 5 years old and had grown leggy and over 3 feet tall while living inside. I took it back out this year, laid the long branches across the table and let nature take its course. The old leaves all bleached and died in the sun while the plant sprouted lots of new leaves down low on the stems; I cut all the long upper stems off and this is what was left. It started blooming late last month and really looks healthy now. Out of curiosity I dipped sections of the cut-back stems in rooting hormone to see if I could start some cuttings. It worked!! Gosh, I really need that greenhouse again. I guess I’ll check the price of grow lights that I can add to the shelves in the craft room. These plants will look great along the front walk next spring. 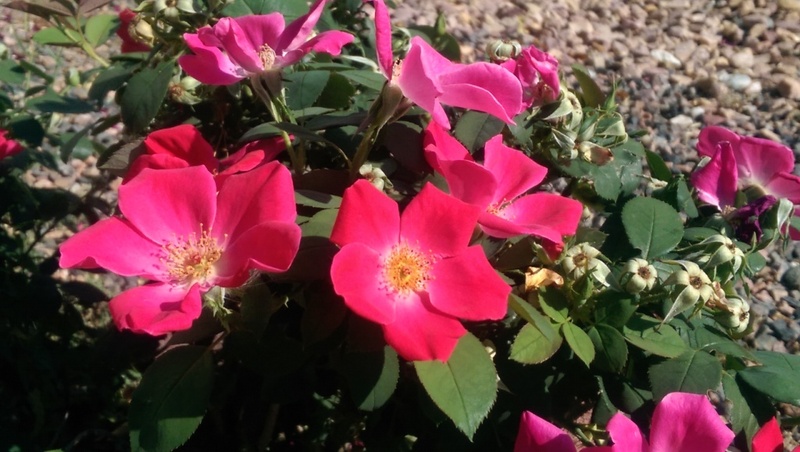 I also have a pot of tea roses that will move indoors. Guess what color they are? Everything that is coming inside is pink. Not exactly the color that I had planned for my winter-time flowers, but these are the ones that will be making the big move. It is just too hard to let the garden go over the winter; I always cling to as much as I can for those months of snow shoveling and gloomy afternoons. Wait what am I talking about? Winter is the months of spinning yarn, knitting like crazy and baking yummy breads and indoor blooms. Instead of knitting outside in my garden I will be working among my garden plants inside. Love all that pink! 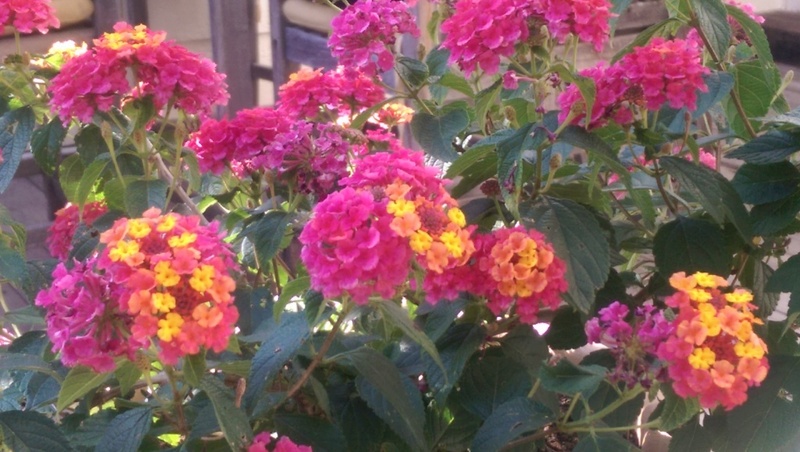 For the record, our lantana is going crazy! I think so. The nursery where we got it said it would and google (the all knowing 😋) says it’s zone 7 hardy. Sadly I am zone 5. They get to hang out in my craft room this winter . Winter is the time of year when yarn warriors and master bakers reign. I can’t wait to unpack my sweaters and I have many, many books and projects waiting for me.